Cyril Thorpe Anderson was born in Wakefield on 9 December 1913, the son of John and Gertrude Anderson. He was one of three children. He went to Lawefield Lane School and then on to a grammar school in the town. After leaving school he was an apprentice engineer at Rhodes and Son and became a qualified fitter at British Jeffrey Diamond. 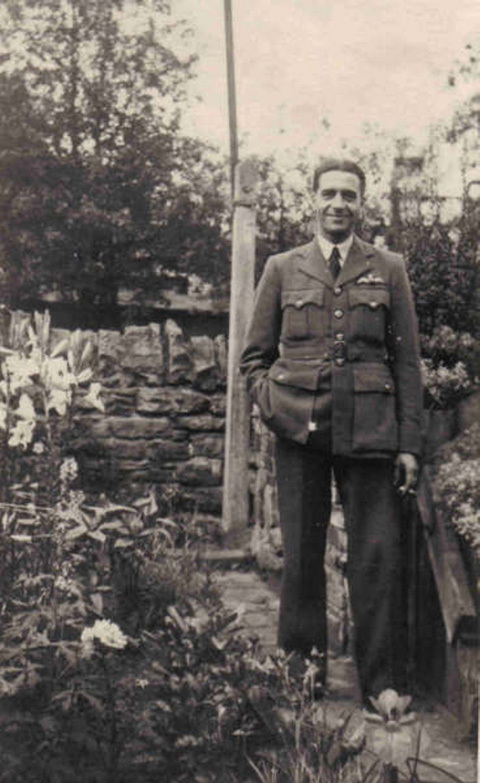 Anderson joined the RAF in 1934 and served as ground crew. When the war started, he volunteered for aircrew and was selected for pilot training in August 1940. He qualified as a pilot in 1942. In the final stages of training he crewed up with all the six men with whom he would fly on the Dams Raid: Robert Paterson (flight engineer), John Nugent (navigator), William Bickle (wireless operator), Gilbert “Jimmy” Green (bomb aimer), and Eric Ewan and Arthur Buck (gunners). They were posted together from 1654 Conversion Unit at Wigsley to 49 Squadron at Fiskerton in February 1943. The crew’s first operation together was an attack on Essen on 12 March 1943. After a successful bomb drop, they lost power in one engine on the way home. Their second trip was to St Nazaire on 22 March. At this point, it seems that the request from Group HQ to send a crew to the new squadron being formed at Scampton was received by 49 Squadron. The CO nominated Bill Townsend and his crew, who had mostly nearly finished their tour, and therefore fell precisely into the category of “experienced crews” which had been demanded. He then chose to add Cyril Anderson to the posting, for reasons that have never been explained. Anderson, with just two operations under his belt, did not demur from the request, but asked to gain some further experience in 49 Squadron before moving. He and his crew were therefore sent on three operations in the next five days, flying to Duisburg on 26 March and Berlin on both 27 and 29 March. Anderson and his wife Rose had got married in 1939 , and their only son Graham was born in December 1942. Sadly he did not survive infancy, dying at just four months old earlier in March. With just seven operations to his name, Anderson was one of the small coterie of inexperienced pilots who took part in the Dams Raid. The others with fewer than ten operations were Vernon Byers, Geoff Rice, Lewis Burpee and Ken Brown. There is no doubt that Guy Gibson was not happy with the fact that he had been given men who did not meet the criteria he had imposed, but he had no option but to go ahead with them. In the event, although they all proved that they could handle the tough training regime, he placed them all towards the end of Operation Chastise’s battle order. So it was that Anderson and his crew were the last to take off on the Dams Raid, leaving the ground at Scampton at 0015. Having crossed the coast AJ-Y encountered heavy flak north of the Ruhr, and was forced off track. By then the rear turret began to malfunction, which meant that it was difficult to deal with searchlights. These caused it to divert off track again five minutes before it reached Dülmen. At 0228, the wireless operator William Bickle received the signal “Dinghy” which directed the aircraft towards the Sorpe Dam. (Some documents claim that it had first been ordered to attack the Diemel Dam, but this is not certain.) By now, mist was rising in the valleys which made the identification of landmarks almost impossible. So it was that at 0310, after consulting his crew, Anderson decided that with dawn approaching and a rear turret not working he should turn for home. Rather than risk following the briefed return routes, he decided to go back the way he had come, crossing the coast at the Schelde estuary. AJ-Y landed at Scampton at 0530, its mine unused. The next morning, Anderson was photographed along with the rest of the pilots who returned outside the Officers’ Mess, but the crew did not remain long on the squadron, and packed their bags that afternoon. Gibson was not happy with Anderson’s explanation. In particular, he was dismissive of Anderson’s account of the valleys being filled with mist. He himself had found his way from the Möhne to the Eder, after all. But this doesn’t take into account the fact that Gibson had left the area before 0200, more than an hour before Anderson had turned back. Hindsight suggests that he was poorly treated. Anderson and his crew returned to 49 Squadron. Just over a month later, on 21 June, all seven, still together, resumed their operational career with an attack on Krefeld. By then Anderson had been commissioned. They flew on 14 more operations after this, but on 23 September they failed to return from an attack on Mannheim. Subsequent research has shown that their aircraft was shot down by a night fighter near Offenbach, as they headed home. Their aircraft was seen flying over the village church trailing fire and crashed into a field. The spot is now marked by a memorial. Five of the crew were recovered from the wreckage and were buried by the local Catholic priest Fr Jacob Storck on 26 September. The bodies of the other two members of the crew (one was Gilbert Green, the other was not identified at the time) were possibly thrown from the aircraft during the explosion and found later. According to Fr Storck, they may have tried to bail out. They were buried on 28 September. After the war they bodies of all seven were exhumed and identified. They were then taken to Rheinberg War Cemetery, where they remain today. Entry on 49 Squadron Association website.